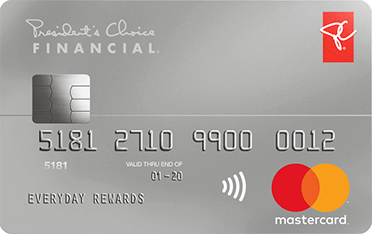 President’s Choice Financial® Mastercard® you’ll get a $100 e-Gift card! Choose Your FREE Gift Card from the Options Below. Have an even better time at the movies with drinks, snacks and more free tickets! Enjoy a great meal from Swiss Chalet, Montana's, Kelsey's, Harvey's or Milestones. Redeem for an Apple Music membership, songs, movies, TV shows, apps, games, books and more. Note: This offer is offered by RateSupermarket.ca and is valid for RateSupermarket.ca subscribers only. If you are not currently signed up, not to worry - you'll automatically be added to our database so that you'll always have insider access to other great offers, like this one. 3Earn 3 cents per purchased litre of Esso Supreme (Octane 91) and Esso SUPREME+ (Octane 93) gasoline only. Earn 2 cents per purchased litre on other gasoline or diesel. Cents per litre is payable in PC Optimum points when you use your President's Choice Financial® World Elite Mastercard at Esso stations in Canada. 2 cents per litre amounts to 20 PC Optimum points. 3 cents per litre amounts to 30 PC Optimum points. 4Earn 2 cents per purchased litre of gasoline or diesel, payable in PC Optimum points when you use your President's Choice Financial® Mastercard® or President's Choice Financial® World Mastercard® at Esso stations in Canada. 2 cents per litre amounts to 20 PC Optimum points. 5Get a bonus 10 PC Optimum points per dollar of your PC travel services purchase (taxes included) charged to your President's Choice Financial® Mastercard® or President's Choice Financial® World Mastercard® and 20 bonus PC Optimum points per dollar charged to your President's Choice Financial® World Elite Mastercard®, in addition to the regular 10 PC Optimum points per dollar earned for all purchases on these cards. Bonus PC Optimum points will be shown as "PC Travel Bonus Rewards" on your PC Optimum points statement. Account must be in good standing. Offer subject to change. PC travel services are provided by 8742995 Canada Inc. doing business as Travel Nation Canada. President's Choice Bank and its related companies are not affiliated with Travel Nation Canada and are not responsible for delivery of the services or liable in connection therewith. 6All PC Optimum members earn 15 points per dollar of eligible purchases at Shoppers Drug Mart. When you use a President's Choice Financial® Mastercard® you will also earn PC Optimum points for all Shoppers Drug Mart purchases charged to the credit card as follows: with the standard PC Financial® Mastercard®, 10 points per dollar; with the PC Financial® World Mastercard®, 20 points per dollar; with the PC Financial® World Elite Mastercard®, 30 points per dollar. 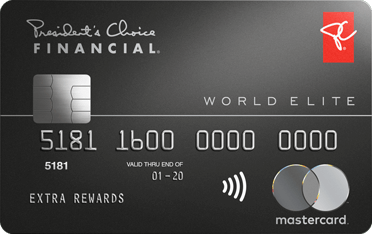 Please note: a minimum annual personal income of $80,000 or household income of $150,000 is required for the President's Choice Financial® World Elite Mastercard®. A minimim annual personal income of $60,000 or household income of $100,000 is required for the President's Choice Financial® World Mastercard®. Subject to credit approval. The information that you use to apply for this offer must match the information that you provide when applying for a credit card. By clicking 'Apply Online' you consent to the disclosure of your account application status by President's Choice® Bank to RateSupermarket.ca for the purposes of reminding you of this offer and of fulfillment and delivery of e-Gift cards to you upon approval of your application and activation of your new card. Be sure to sign-up to receive emails from RateSupermarket.ca for the latest news, reminders and money-saving tips. You may unsubscribe at any time. These Terms and Conditions ("Terms") are applied to this RateSupermarket.ca gift cards/certificates promotional offer ("Promotion"). This Promotion is only available through RateSupermarket.ca and is only valid online through the RateSupermarket.ca website. Please see the merchant gift card/certificate for additional terms and conditions, which are subject to change at merchant's sole discretion. President's Choice Financial®, the credit card issuer ("Issuer"), is not responsible or liable for any aspect of this Promotion. The listed gift card merchants are in no way affiliated with RateSupermarket.ca and President's Choice® Bank, nor are the listed merchants to be considered sponsors or co-sponsors of this Promotion. Use of merchant names and/or logos is by the permission of each respective merchant and all trademarks are the property of their respective owners. This Promotion commences at 12:00PM EST on January 1, 2018, and closes at 11:59PM EST on April 30, 2019 ("Offer Period"). - Not already have any President's Choice Financial® credit card account, or have applied via RateSupermarket.ca for any President's Choice Financial® Credit Card account within twelve (12) months prior to the commencement date of this Promotion. This Promotion is only open to new President's Choice Financial® online credit card applicants. - Click on the specified link, which may change from time to time without prior notice from RateSupermarket.ca, on the RateSupermarket.ca website to apply for the featured credit card(s). Applications must originate from the specified link on the RateSupermarket.ca website. Applications placed over the phone, through online chat, or any other method will not be valid. - Complete the President's Choice Financial® online credit card application and receive confirmation from the Issuer that the application has been approved and the credit card is activated. - Provide Participant contact details, including name, phone number, and email address to RateSupermarket.ca, which must match the details used to apply for the credit card(s) exactly. If any details are inconsistent or do not match, then the Promotion is invalid. - Authorize RateSupermarket.ca to receive information regarding credit card approval & activation status, and the time and date of credit card activation, approval or decline. Each Participant in this Promotion is only eligible to receive one (1) gift card per Issuer for the duration of the Promotion and the Offer Period. Gift cards will only be fulfilled following confirmation of activation from the Issuer to RateSupermarket.ca. If such confirmation of credit card activation from the Issuer is not received by RateSupermarket.ca, this Promotion is invalid. - Apply online and when you receive your PC Financial® Mastercard® credit card, you will also receive four welcome coupons or offers each worth 5,000 PC Optimum points. Use your PC Financial® Mastercard® and redeem each coupon or offer to receive 5,000 PC Optimum points with any purchase at the checkout in participating grocery stores where President's Choice® products are sold. See coupons or offers for full details. Coupons or offers have no cash value. For all offers, allow 2-3 weeks from qualifying purchase for bonus PC Optimum points to be awarded. Each offer is limited to one per new PC Financial® Mastercard® account and may be terminated or changed at any time without notice. Minimum redemption is 10,000 PC Optimum points (worth $10 in free rewards) and in increments of 10,000 points thereafter at participating stores. Some redemption restrictions apply. Visit pcoptimum.ca for details and full store list. Completed credit card application approvals can take up to sixty (60) business days to be processed by the Issuer. Approved credit card applicants will be notified by the Issuer. Once the approved credit card has been activated, notification that the Participant has successfully qualified for the Promotion will come from RateSupermarket.ca by email. Eligible gift cards will only be sent to qualified Participants via email and all other delivery methods will not be offered by RateSupermarket.ca. Gift cards will be emailed to qualified Participants to the email address the Participant provides. Neither RateSupermarket.ca nor the Issuer are responsible for email address inaccuracies provided by the Participant. RateSupermarket.ca will distribute the Promotion to Participants who have successfully qualified following confirmation from the Issuer that the credit card has been activated. Please allow up to eight (8) weeks for gift card fulfillment processing after credit card activation confirmation from the Issuer to RateSupermarket.ca. RateSupermarket.ca reserves the right, at any time, to cancel, modify or suspend this promotion. Any issues with gift card fulfillment must be brought to the attention of RateSupermarket.ca within three (3) months of the application date. How do I apply for this promotion and receive my e-Gift card and 20,000 PC Optimum points? Once you're done, hit the Apply Online button to be transferred to the secure online President's Choice Financial® credit card application form. Complete the online credit card application form and submit it to President's Choice Financial® - your application is finished. Step 2: Receive your login details from RateSupermarket.ca. You will receive a RateSupermarket.ca email with your user log in and password information. Keep this info to access your RateSupermarket user profile. Once you have received approval from President's Choice Financial® for your new credit card account and have activated your new card, log in to your RateSupermarket.ca profile to check the status of your offer. Please note it can take up to 60 days for President's Choice Financial® to process and confirm the status of your application. RateSupermarket.ca must receive confirmation of your credit card account approval from President's Choice Financial® before your gift card can be sent. This can take up to 8 weeks. Step 4: Get your gift card! Once RateSupermarket.ca receives confirmation of your approval and activation from President's Choice Financial®, your e-Gift card will be emailed to the email address you provided to RateSupermarket.ca. Please allow up to 8 weeks for processing. Step 5: Get your 20,000 PC Optimum points! I already have my new credit card, but have not yet received my gift card. Why? RateSupermarket.ca must receive confirmation of your credit card approval and activation from President's Choice Financial® first before sending out your e-Gift card, even if you have already received your new credit card. It can take up to 4 weeks for President's Choice Financial® to confirm this information with RateSupermarket.ca. Once RateSupermarket.ca receives confirmation of your qualification, your gift card will be emailed to the email address you have provided to RateSupermarket.ca. Please allow up to 8 weeks for processing. How can I check on the status of my gift card? Log in to your RateSupermarket.ca user profile to see the status of your gift card qualification. You will receive login details for your profile from RateSupermarket.ca when you apply for this promotion. Can't find your login or password? Follow the password recovery directions, or email customercare@ratesupermarket.ca. All approved customers who apply during the offer period (January 1 - April 30, 2019) that activate the featured credit card will receive a FREE e-Gift card from RateSupermarket.ca. To participate in this promotion, you must first provide your information to RateSupermarket.ca, then click through the 'Apply Online' link on RateSupermarket.ca promotional page and apply for, be approved and activate the featured credit card. Applicants must apply within the offer period (January 1 - April 30, 2019) for their application to be eligible for this promotion. I've been approved! When will I receive my PC Optimum points and e-Gift card? - Wait for RateSupermarket.ca to receive confirmation of your status from President's Choice Financial®. Please note this can take up to 4 weeks. - Once RateSupermarket.ca has confirmation that your credit card has been activated, you will be emailed your e-Gift card to the email address you provided to RateSupermarket.ca. Please allow up to 8 weeks for processing. - *When you receive your PC Financial® Mastercard® credit card, you will also receive four welcome coupons or offers each worth 5,000 PC Optimum points. Use your PC Financial® Mastercard® and redeem each coupon or offer to receive 5,000 PC Optimum points with any purchase at the checkout in participating grocery stores where President's Choice® products are sold. See coupons or offers for full details. Coupons or offers have no cash value. For all offers, allow 2-3 weeks from qualifying purchase for bonus PC Optimum points to be awarded. Each offer is limited to one per new PC Financial® Mastercard® account and may be terminated or changed at any time without notice. I already have one of these credit cards. Can I still apply and receive a gift card upon activation? Sorry - this promotion is open only to new President's Choice Financial® credit card applicants who apply online through the Ratesupermarket.ca promotional page. This promotion is open to subscribers of RateSupermarket.ca only. If you are not a subscriber, you must subscribe before you apply for your credit card in order to be able to claim your e-Gift card. You may unsubscribe any time after you have received your gift card, if you wish. Sorry - only online credit card applications placed through the RateSupermarket.ca's special promotion page are eligible for this promotion. Credit card applications submitted any other way are not eligible for a gift card. To sign up for this promotion, you must provide your first and last name, phone number and email address. Please note that any information you provide in your credit card application is confidential and not accessible by RateSupermarket.ca. Unfortunately, we can't help you with that. The credit card issuer will not provide us with any details about declined applications, so that type of information will stay private. If you want to know why your application has been declined please contact the credit card issuer directly. I haven't received my approval yet and the promotion is ending! Will I still qualify for my gift card? Don't worry - as long as you applied for the credit card, using the link on the offer page on RateSupermarket.ca, during the offer period (January 1 - April 30, 2019), you can still qualify for the offer once the card has been activated.